Today is 20 is a free a website to make life easier for Getty Images Contributors. We turn the ugly .TXT file from the Getty Images export data section into an attractive data with images, charts, stats and much more. Don't press F5 each 10 seconds between the 18th and the 21th (or 22th, or 23th, or...) of each month! Just wait the email from todayis20. We turn the ugly .TXT file into an attractive data with images, charts, stats and much more. You will see thubnails of your sales, charts by collections, maps of costumers and much more! We don't need your ESP / Getty / iStock credentials. Just we need your monthly royalty statements txt. Compare and analyze your data across the time. 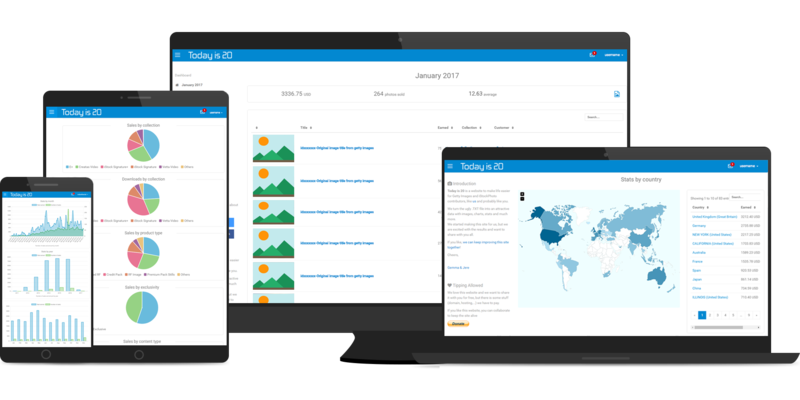 You will get more stats than you expect from your whole Getty or iStock life! The kindness of some Getty and iStock contributors through tips made todayis20 completely free. Todayis20 was made 4 years ago for a couple of Getty Images' contributors and their 3 cats. In november 2016 joined the team a very [very] young member. What our new friends say about todayis20? “Hey- this todayis20 thing is brilliant- turns the txt file back into the old iStock style info. “Hello! Thank you for stats for iStock users! It's easy to read and understand! Great work! Todayis20 is a present from Jere to Gemma to celebrate 9 years of love.